Prom is an All-American rite of passage for high school students. It’s time to dress up, hang out with friends and dance the night away. For girls, it means finding the perfect dress, one that makes them feel beautiful and helps make memories that will last a lifetime. Yet, for many of our refugee students, prom is unattainable due to very limited financial means. 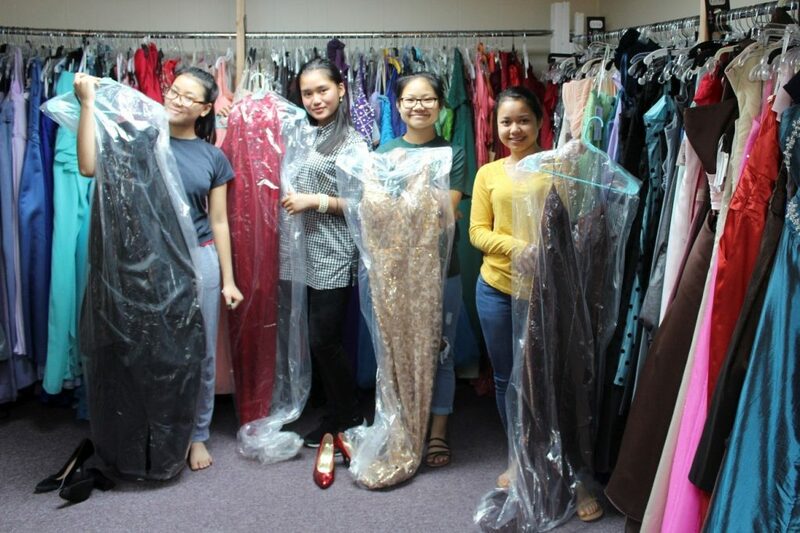 This past weekend, we took four pretty high school girls prom dress shopping. Thanks to Becca’s Closet’s chapter in Fairview, TN, the girls were able to choose and receive a dress for free. Through many generous donations, Becca’s Closet has a fabulous collection of quality dresses to select from. The girls tried on at least a dozen before they found the one perfect dress. Each dress selected matched the girl’s personality. A stunning red Asian inspired gown was selected by a stunning Myanmar girl. The outdoorsy, sporty girl selected a gold number that fitted her like a glove and didn’t have any of the frilly foo-foo adornments. A simple black dress was selected by another and looked amazing with the girl’s bomber jacket, a tough/tender combo just like her. The quiet reserved girl of the bunch chose a simple mauve dress with golden shimmers, which matched her beautiful complexion perfectly. They promised to take a photo of the four of them together at prom in their dresses. The High School Prom is a big deal for American students. But it’s an even bigger deal for our refugee/international students. They are experiencing life in a new and different world. It can be overwhelming without support and guidance. By helping them through prom, they gain confidence in this new and sometimes strange land. It is this confidence which betters their chances to succeed and thrive.